Everyone uses problems and summaries very differently. This inconsistency makes it dangerous as information can be either omitted or duplicated. At Ardens, we believe that ‘Problems’ should only be used for significant long term conditions (eg asthma, cancer, hypertension) and not for triage like complaints (eg cough, ankle problems). The ‘Summary’ can then be used for non-clinical items. If you are using an Ardens long term condition template like asthma, it will automatically make asthma a problem. You can then click the asthma problem in the clinical tree, which will show you all the Asthma related consultations. If you’re searching for all triage like issues, the best thing to do is to click the search box in the journal and then type in “cough” for example. This way you should see all the cough related issues. For referral forms, it is important that both problems and summary entries are merged so they include any relevant information. To avoid unnecessary sharing of information that may result in a the relevant information being lost amongst other entries and to also avoid causing potential GDPR issues, only active major problems and current major summary items are included. 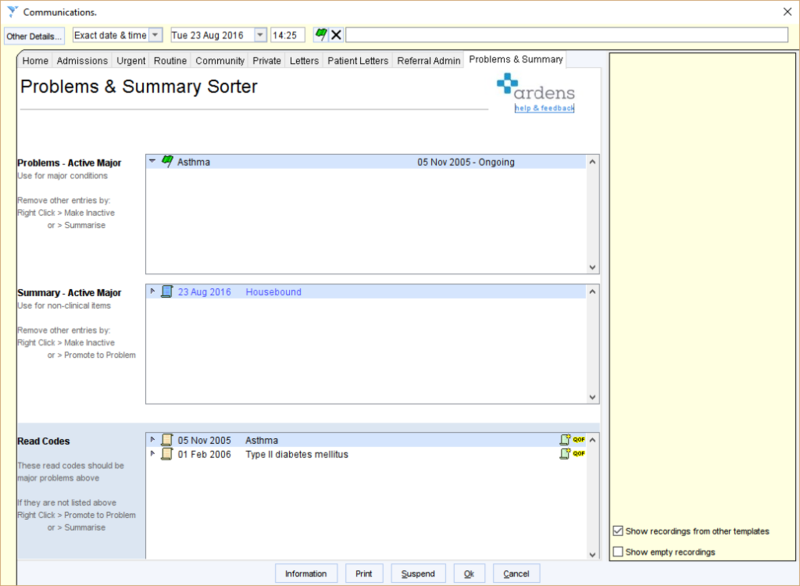 Ardens has a ‘Problem & Summaries Sorter’ template to help this. To access this, click the orange arrow icon under the patients name and on the ‘Communications’ template, click the link to the ‘Problem & Summary Sorter’ template – see screenshot below. At the top is a view of their current Active Problems and Summary items. If there is something inappropriate in one of these views, just right click the entry and deactivate it. At the bottom of the template is a view of common diagnoses that the patient has. You can check that they all have an associated problem. If they do not, just right click the diagnosis and promote it to a problem.